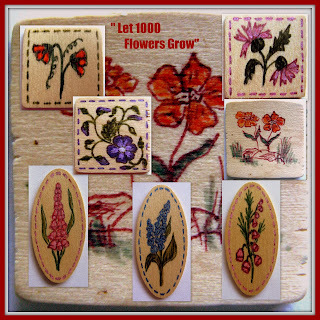 follow up from previous blog, http://conniekonnykards.blogspot.com/ I am retired here in UK, well into my seventies, and I have crafted as long as I can remember. OH John and I have been happily married for 54 years. We have a lovely family and a cat with attitude ...... Lots of work from my hobbies is on Flickr. As we had always lived in the same house and had a flower garden I knew I had done just that over many years. 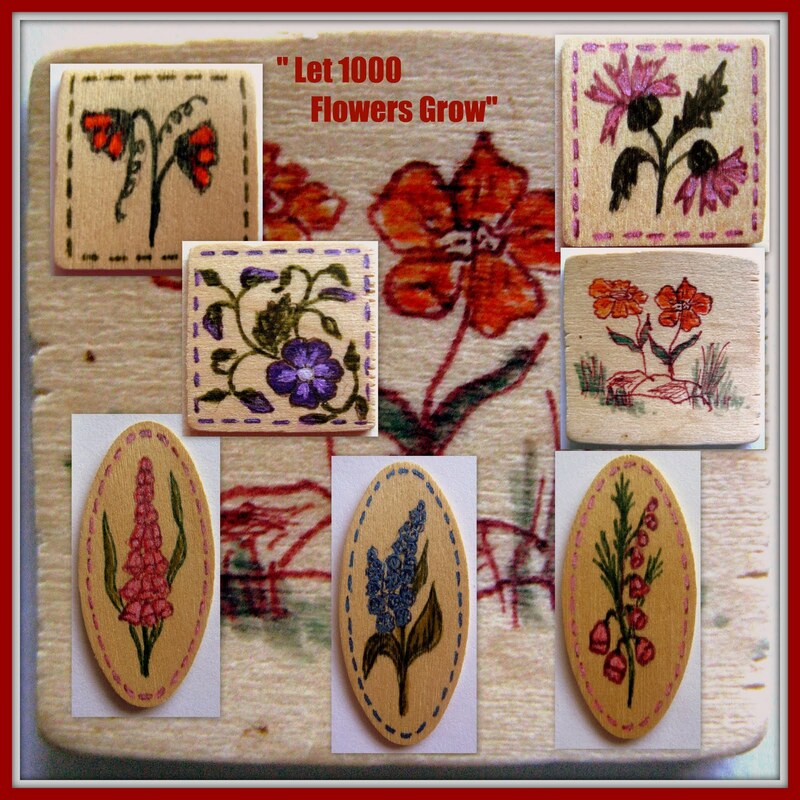 But I decided it would be a theme in retirement, in art and a variety of crafts. 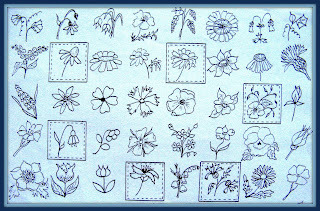 This was before I had a PC so all drawings, paintings, doodles and scribbles were in various sketch books and a fat A4 file - some pictures, textile art, and stitching were framed, most put into drawers or boxes. Now my craft room, well everywhere, is a chaotic mess of my collections and I must do some sorting and weeding. 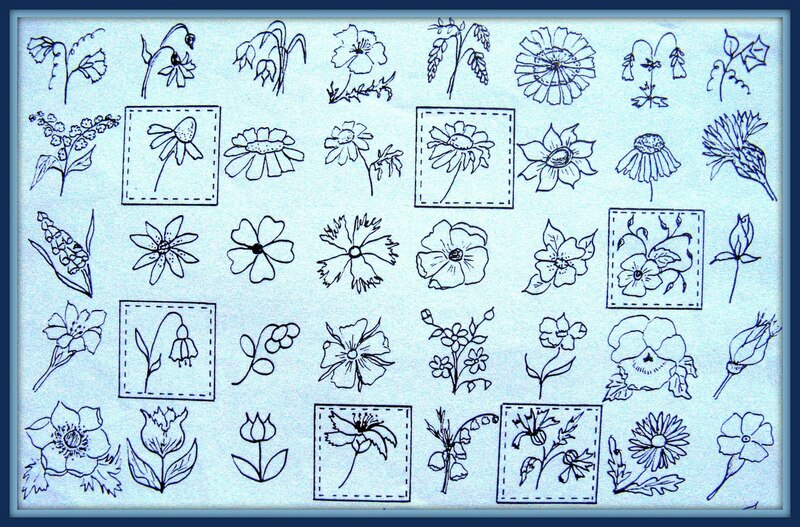 Above is an early sheet of outlines, used for reference in making many greetings cards, which I sold for charity. Can we follow you going through things??? Sorry about deleting the comment...I just meant to edit it and add another comment about your stitching. Your "clutter" is so interesting I just love your flowers and your cards. They are wonderful. I like doing shisha mirrors, although I found them difficult as well. What are the discs, they look good. A big thank you to all friends who visit and make such lovely comments here. I'm sorry that I don't reply and comment as I should, though I love looking at the many interesting blogs and admiring so much talent! Connie. As I have mobility problems, and often get pain here and there, my philosophy these days has to be as Confucius said, "It does not matter how slowly you go, so long as you do not stop". "When you have only two pennies left in the world, buy a loaf with one and a lily with the other." "To see a world in a grain of sand - Heaven in a wild flower - and eternity in an hour." 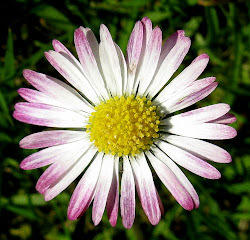 "Just living is not enough, one must have sunshine, freedom, and a little flower ..... "